Several major news outlets in the United Kingdom recently published articles or produced programs calling for an end to the killing of prisoners of conscience for organs in China, including the BBC, The Guardian, Sunday Express, and Scotsman. A discussion titled “Forced Live Organ Extraction in China” took place at the British House of Parliament on March 26, 2019, offering media a timely news hook to delve into the issue. Hosted by MP Jim Shannon, chair of the all-party parliamentary group on freedom of religion and belief, 12 parliament members from a number of different political parties joined the discussion, voicing their outrage and concern over the state-sanctioned crimes of forced organ harvesting in China. BBC Radio 4 covered this event with a segment that was aired the following day during its “Yesterday in Parliament” program. 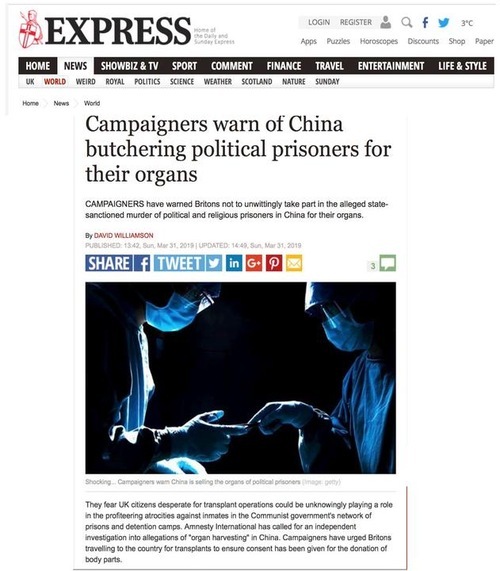 An article by David Williamson, Deputy Political Editor of the Sunday Express, titled “Campaigners warn of China butchering political prisoners for their organs” was published on March 31. Williamson wrote that people in Great Britain had been warned not to unwittingly participate in the state-sanctioned murder of political and religious prisoners in China for their organs. The author also drew attention to a 678-page report, published in 2016 by former Canadian secretary of state David Kilgour, investigative journalist Ethan Gutmann and lawyer David Matas, which states, “Organ pillaging in China is a crime in which the Communist party, state institutions, the health system, hospitals and the transplant profession are all complicit. Williamson also cited the China Tribunal, which was launched to investigate the claims of organ harvesting and to interview witnesses who had been prisoners in China. “It is beyond doubt on the evidence presently received that forced harvesting of organs has happened on a substantial scale by state-supported or approved organisations and individuals,” the tribunal’s interim judgment continued. Williamson’s article included testimony from Falun Gong practitioners Yu Xinhui and Dai Ying, who told the China Tribunal about the mistreatment they received in China for their belief. They were subjected to illegal imprisonment, beatings, torture, force-feeding, sleep deprivation and electric shocks. “Mrs Dai had heart disease, which resulted in her medical exams being stopped, but she recalled that some Falun Gong practitioners disappeared after the testing procedures were complete,” Williamson wrote, quoting a report from Doctors Against Forced Organ Harvesting. An article “Call for UK to ban patients travelling to China for ‘organ tourism’” written by Owen Bowcott, legal affairs correspondent for The Guardian, was published on March 31. The article stated that 40 MPs were backing a call to ban UK patients from traveling to China for organ transplant tourism, ahead of the next session of hearings of The China Tribunal in early April. Bowcott quoted MP Jim Shannon, who told MPs at a parliamentary debate last week that the UK government should consider imposing an organ tourism ban like those already enacted by Italy, Spain, Israel and Taiwan. Bowcott wrote that the China Tribunal “has been taking evidence about alleged mispractices from medical experts, human rights investigators and others.” He wrote that China has declined to attend the hearings. He also added that Falun Gong practitioners are among victims of forced organ harvesting. An article by Alistair Carmichael MP was published in The Scotsman on March 19, highlighting forced organ harvesting and human rights abuses in China. “The close monitoring of religious observance is also nothing new. The tools for that monitoring and oppression may have changed from secret police and informants, to surveillance cameras and internet tracking, but the fundamental oppression remains as strong and widespread as it ever was,” he wrote. In particular, he cited the forced organ harvesting from Falun Gong practitioners, Uyghurs, Christians, Tibetan Buddhists, as a serious issue. “The idea of forced harvesting sounds simply unbelievable. What human could kill another human for their organs? It is easy to dismiss as ridiculous hyperbole, but it is not ridiculous,” Carmichael wrote.